TOMS RIVER, NJ -- Rock star Jon Bon Jovi stunned a fan in New Jersey with a very welcome surprise visit. 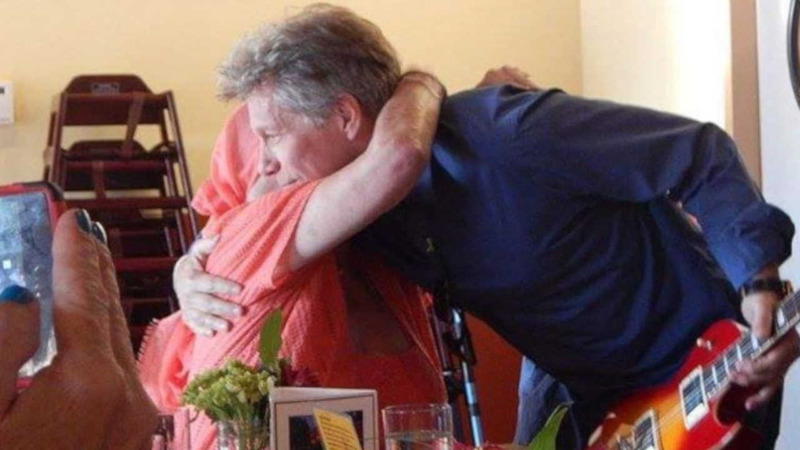 Bon Jovi unexpectedly appeared at Carol Cesario's table on Friday at the rocker's 'Soul Kitchen' restaurant in Toms River. Cesario, who is a huge Bon Jovi fan, is battling lung cancer. Bon Jovi sat with her family for more than an hour. He also presented her with an autographed guitar. Cesario's daughter wrote on Facebook that it was one of the best days in her family's life, and seeing her mom that happy filled her with so much joy. Rosie Skripkunis says her mother is a lifelong fan of Bon Jovi and has always wanted to meet him. Last month, Skripkunis shared a sign on social media asking the singer to visit her mother. Skripkunis later told her mother that Bon Jovi's Toms River restaurant, JBJ Soul Kitchen, had invited them over for a free meal. While at the restaurant on Saturday, Bon Jovi sneaked in behind Cesario and stood beside her without saying anything. Video shows Cesario yell out "oh my God!" after seeing Bon Jovi. He gave her an autographed guitar and a book, as well as a kiss on the cheek.